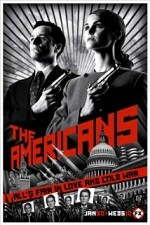 Watch The Americans: A pair of deep-cover Soviet spies masquerades as a typical DC couple whose children, neighbors, coworkers & friends are completely unaware of their activities. At home, they're the stereotypical parents of stereotypical kids; at work, they pose as travel agents; but at night, they weave a web of confidants, lovers, dupes, and historical figures from the Reagan-era Cold War. The startlingly realistic plot twists force the viewer to consider the real cost of an undeclared war, what it takes to protect one's beliefs, if it's worth it, and if it actually worked for either side. Episode 9 - Do Mail Robots Dream of Electric Sheep? 1980s cold war cold war era double identity double life espionage falls church virginia family relationships female lead husband wife relationship KGB secret identity Sleeper Agent soviet spy Soviet Union Spy Undercover Washington D.C.